As human beings we often box ourselves into separate categories that describe our position, actions and behaviors in profession, family and social life, physical activity, hobbies and perhaps religious or spiritual life. We are multi-faceted and, fair to say, complex. Solutions are often multi-disciplinary. 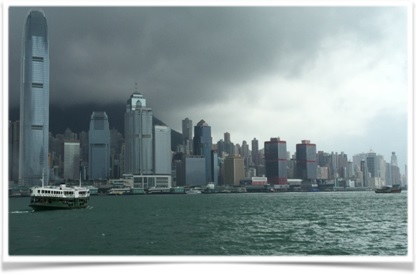 Thus, working on one aspect to the detriment of others may create imbalances and setbacks. 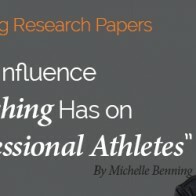 Thus, performance coaching cannot be developed in isolation and independently from all the elements that underpin personal and professional growth. 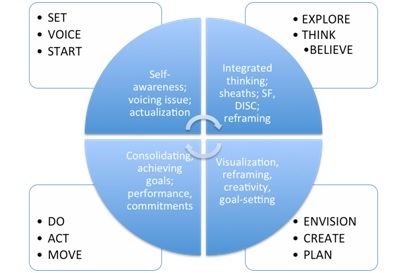 The integrated coaching model offered here stems from a belief that the interconnectedness of these areas introduces a positive complexity and that working with this complexity will lead to a holistic path to growth and excellence, which can be applied to both professional and personal life, for performance as well as for wellness. The combination of self-exploration with targeted questions and the creation of a dedicated space for clients’ growth can help accomplish things well, exhaustively and with enjoyment. The representation of the model through a flow matrix and a traditional matrix can assist in give the client a visual representation of the process of learning and growth. The integrated matrix of this model (see above and p.4) represents a visual aid for a process that encompass several disciplines and explore situations from different angles. With a belief in the body and mind as one integrated system, and with a theoretical and practical grounding in emotional intelligence, positive psychology, yoga philosophy, modern assessment tools and visualization techniques, the flow matrix represents a helicopter view of the process, where each step reinforces the next but it also a new beginning. This can happen in a session, over several sessions, months or years. 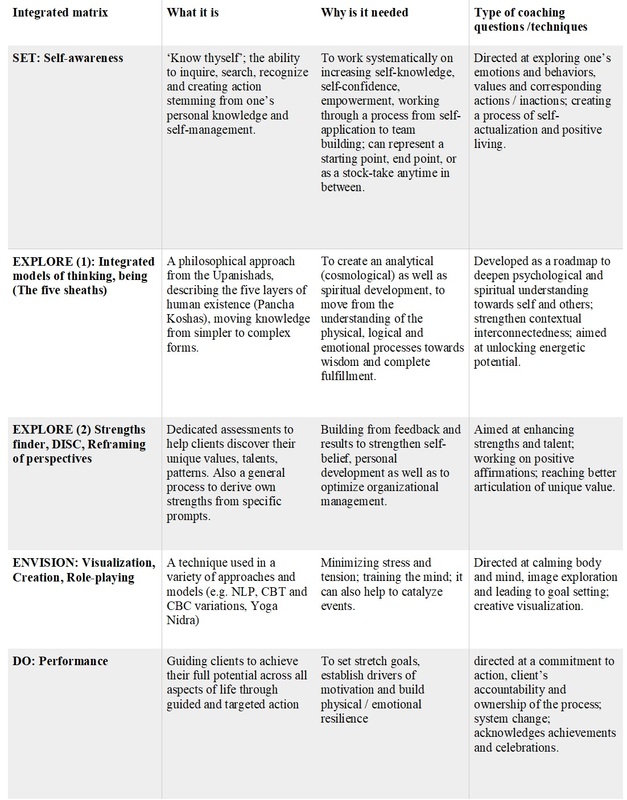 If we look at the traditional matrix (below, p.4), techniques and questions can be explored horizontally (dealing with one aspect or tool at a time) or in both directions, in order to lead to a complete process of learning and growth, as well ownership of the development process from a client. It is purposely fluid and overlapping in some parts. It is non-sector specific in order to broaden its application to several fields, from executive and managerial growth to sports, artistic performance, and wellness coaching. 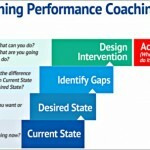 Like a seed that has potential to grow with care, energy and commitment, the process of coaching for performance and development encompasses many stages, and each of this stage can include further, more detailed steps. Setting the stage or coaching session is a space for a client to open up, to voice the issues, and for the coach to get to know the client and the work to be done. 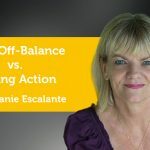 An important principle here is self-awareness, derived from Daniel Goleman’s research on emotional intelligence, which can guide clients to inner exploration and help determine what to let go of and what to work on further. It is seen as a starting point to begin one’s journey but it could as effectively represent a reference point to come back to at any stage in the coaching. The concept of exploring in coaching can be achieved in several ways. The five sheaths are an ancient and still used model in yoga philosophy, embedded in both physical practice and theoretical study, to unveil the different layers of being and consciousness. Working on one’s health, concentration, mindfulness of breathing can ultimately lead to a iterative process of self-knowledge and self-awareness. This can free up mental space and foster balance, thus leading to perceptions which, in turn, can help a client discover their inner values and strengths. Working with dedicated tools (StrengthsFinder, DISC) as well as through powerful questions and prompts can take the clients to a position where emphasis can be put on strengths rather than weaknesses. Building strengths from talents and understanding natural patterns and behaviors can translate into increased energy and motivation to do well. Visualization and role plays are part of an envisioning process that can take the knowledge of the client’s values and talents into a higher platform, with a positive reframing of beliefs is achieved. New, empowering perspectives can help ideas, vision and dreams translate into goal-setting. These elements are at the basis of doing from which we create actions leading to performance that can take the client perhaps towards their set goal, or maybe out of their comfort zone towards outcomes that were not envisaged at the beginning of the coaching journey. This model creates an iterative process of change (culture hacking) with both theoretical and practical applications to grow one’s full potential in all areas of professional and personal life. Self-awareness: What does it feel to be right now? What’s happening?What would you like to achieve? What kind of picture do you have right now? What is holding you back? What is standing in the way? What are the critical elements in this issue?What strengths could you use to handle this situation?What is the worst thing that could happen here? The five sheaths: How do you feel at this point? What is the state of your physical health? May I invite you to close you eyes and [mindfulness of breathing meditation; square visualization meditation; yoga nidra & relaxation techniques; other niche-specific exploratory or diagnostic tools]. Strength finder, DISC: What are your top 3 / 5/ 10 strengths? In visualizing situations of success, what type of communication was used? How can you describe decision-making and relations to peers / employees / others? In a recent successful case or event, what was your contribution? How do you describe your strengths / talents? 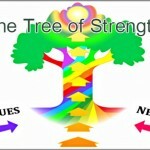 What is underneath your strengths and talents? How can those be used in the future? What patterns of behavior can you notice? What is your natural and adaptive style? How does thins influence your work, personal life? How are these behaviour reflected in your life? How are they expressed? What type of control of self-limitations are there vis-a-vis these behaviors? Where do you notice you perform best? It all starts with a vision – which is yours? Visualization: May I invite to [creative visualization; to take a few steps towards…; a visualization tool / tole play]. What can you see? What can you hear? What do you see yourself doing? Who or what is around you? How do you feel? Reflecting on a recent goal, what were the factors that led to success? What evidence do you have to prove to yourself that you can do this? How do we make change stick? Introducing the four steps of creative visualization (Shakti Gawain). What is the desired goal? What structures need to be put in place to achieve this goals? What are the next steps?What can you put in place to achieve this goal? What type of support is needed? What are the possible obstacles? How will you make yourself accountable for the same? How would you know you have achieved the goals? What are the feelings associated to having achieved the outcome/s? 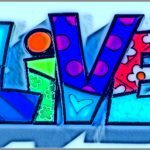 What difference is it going to create in your life? What can you celebrate now? Drucker Peter, ‘Managing Oneself’, HBR On Managing Oneself, HBR Press, pp.13-32. Goleman Daniel, ’What makes a Leader’ in HBR On Emotional Intelligence, HBR Press, pp.1-21. Goleman Daniel, Boyatzis Richard, McKee Annie, ‘Primal leadership’, HBR On Emotional Intelligence, HBR Press, pp.23-42. Shakti Guwain, ‘Creative Visualization. New World Library, 1995.